British Virgin Islands with its capital Road Town is located in North America (Caribbean, between the Caribbean Sea and the North Atlantic Ocean). It covers some 152 square kilometers (about 0.9 times the size of Washington, DC) with 35,015 citizens. English is the language commonly spoken used by the people in British Virgin Islands. This country shares no land borders with another country. The British Virgin Islands are a self-governing British overseas territory, situated in the Caribbean just to the east of the US Virgin Islands. Nature is the main attraction in the islands, with coral reefs, white sandy beaches, and scenic seaside villages the main draw. Other attractions include historic villages, churches, and, if the sun is too much for you, a museum in Road Town, the shady Botanic Gardens or the rain forest on Sage Mountain in Tortola. The landscape is coral islands relatively flat and volcanic islands steep, hilly. The average density of population is about 232 per km². The climate in British Virgin Islands can be described as subtropicalhumid, temperatures moderated by trade winds. Potential threats by nature are hurricanes and tropical storms (July to October). To reach someone British Virgin Islands dial +1-284 prior to a number. The local cellular networks are operated on 850 MHz, 900 MHz, 1800 MHz, 1900 MHz, 3G, 4G. Websites typically end with the top level domain ".vg". If you want to bring electric appliances (e.g. battery chaarger), keep in min the local 110 V - 60 Hz (plugs: A, B). The sign for the locally used currency Dollar is USD. 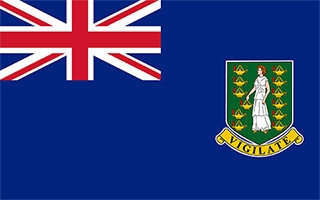 Blue with the flag of the UK in the upper hoist-side quadrant and the Virgin Islander coat of arms centered in the outer half of the flag; the coat of arms depicts a woman flanked on either side by a vertical column of six oil lamps above a scroll bearing the Latin word VIGILATE (Be Watchful); the islands were named by COLUMBUS in 1493 in honor of Saint Ursula and her 11 virgin followers (some sources say 11,000) who reputedly were martyred by the Huns in the 4th or 5th century; the figure on the banner holding a lamp represents the saint; the other lamps symbolize her followers. First inhabited by Arawak and later by Carib Indians, the Virgin Islands were settled by the Dutch in 1648 and then annexed by the English in 1672. The islands were part of the British colony of the Leeward Islands from 1872-1960; they were granted autonomy in 1967. The economy is closely tied to the larger and more populous US Virgin Islands to the west; the US dollar is the legal currency. On 6 September 2017, Hurricane Irma devastated the island of Tortola. An estimated 80% of residential and business structures were destroyed or damaged, communications disrupted, and local roads rendered impassable.